Caring for your Shuffleboard Table is easy with our complete line of the best Table Shuffleboard maintenance products. Choose an individual product or select the complete Maintenance Kit, which contains one of each of the cleaner, polish, and silicone spray. Our popular 1•2•3 Shuffleboard Cleaner™ will get your table ready for polishing in no time! Only 20 minutes, once a month is all the time you need to spend to keep your shuffleboard table in top condition. After the cleaner, apply our 1•2•3 Shuffleboard Polish/Wax™ to remove most scratches and polish your table to a brilliant shine. 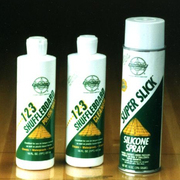 Our Super Slick® Silicone Spray, should be used weekly to maximize the performance of your Shuffleboard Table Speed Powder, as well as to protect your table's finish and prevent scratches. Used together, these products are a complete shuffleboard maintenance solution that will increase the enjoyment you get from your shuffleboard. Peak performance for your Shuffleboard Table, brought to you by The Shuffleboard Federation.